Increased Egg Numbers in Next Generation W-36The Hy-Line W-36 has been and continues to be the bird of choice for producers around the world who need a highly efficient white egg layer with dependable production. 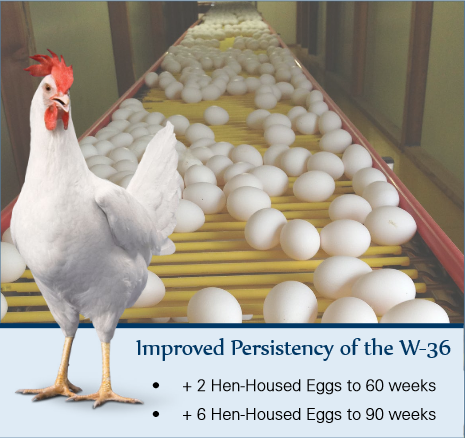 To meet increased global demand, the newest generation of W-36 now entering the commercial market has improved persistency – an increase of 2 hen-housed eggs to 60 weeks and 6 hen-housed eggs to 90 weeks over the previous generation. The improved persistency comes while maintaining the characteristic world-leading feed conversion, best-in-class livability, and highest percent solids, which is highly valued by egg breakers. The current W-36 commercial generation in the field is yielding a higher rate of genetic gain in the most important characteristics over previous generations, as the benefits of the new accelerated genetic advancement program implemented two years ago are being realized.